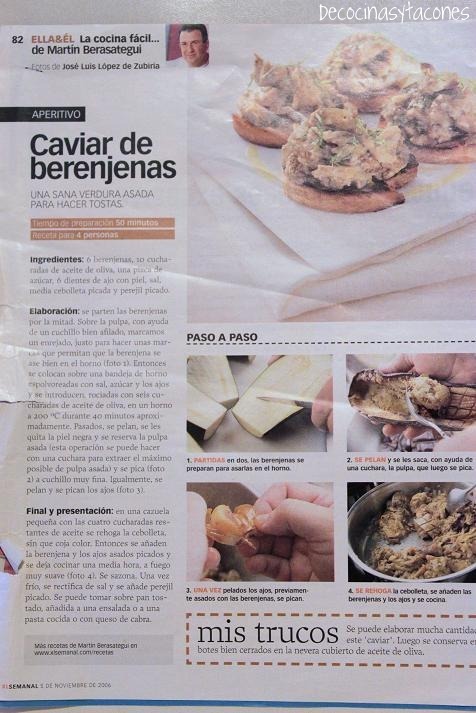 De nuevo estoy hojeando mis archivos de recetas y me encuentro con esta de Martín Berasategui, publicada en la revista de El Semanal, el 5 de Noviembre del 2006. ¿Por qué la guardé?, evidentemente porque las berenjenas me vuelven loca así que tarde o temprano la iba a hacer. Aquí la tengo hoy para compartirla con las que lean este blog. Again I´m browsing through the files where I have my old recipes, and I´ve found this one, published by Martín Berasategui on the 5th November 2006. 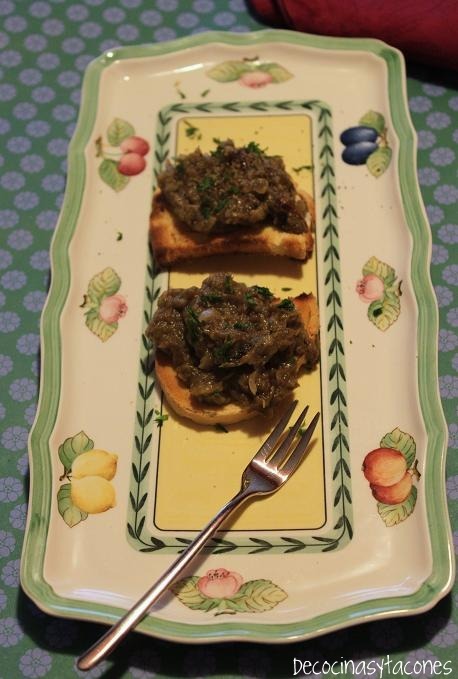 Why have I kept this recipe?, well it´s clear, I´m crazy about eggplants, I eat them in any possible way so I was sure sooner or later I was going to make this. 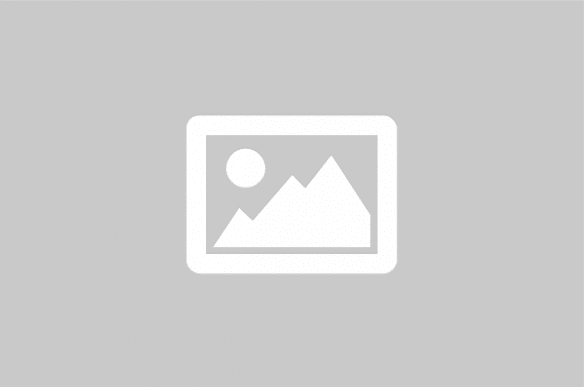 Today I´m going to share it with all the people who reads this blog. Cortar las berenjenas por la mitad. 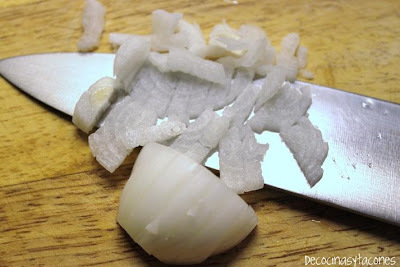 Con ayuda de un cuchillo, hacer unos cortes para que la berenjena pueda asarse bien en el horno. 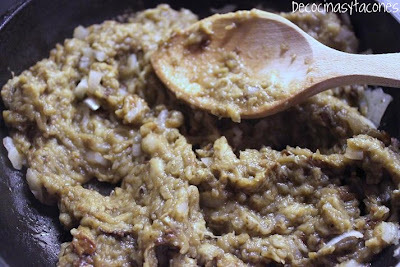 Colocarlas sobre una bandeja de horno con los ajos. 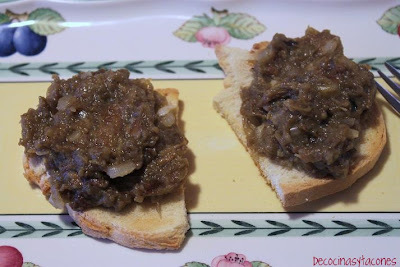 Se espolvorean con sal y azúcar y se le echa el aceite de oliva por encima. 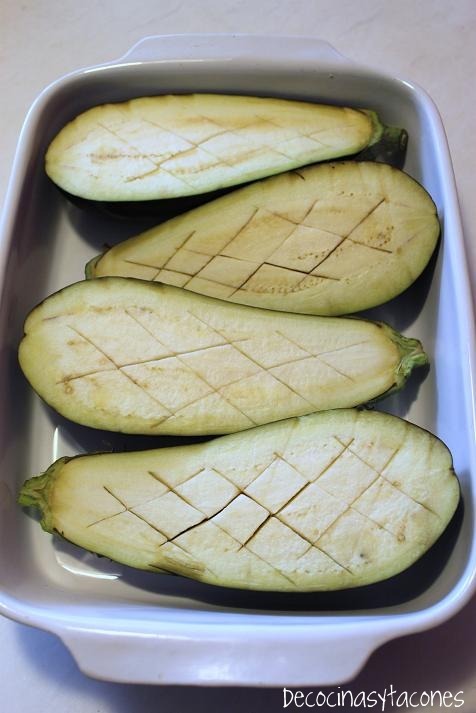 Cut the eggplants in half. 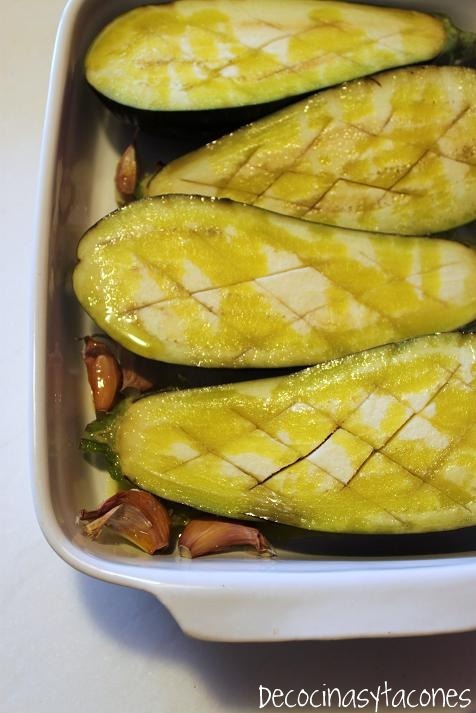 With a knife, make some cuts on the pulp of the eggplants so they can be cooked to perfection in the oven. Put them in a baking tray with the cloves of garlic, the salt, the sugar and pour over them the olive oil. Pasado ese tiempo, se sacan del horno y se dejan enfríar. Se les quita la pulpa con una cuchara y se reserva en un bol. Los ajos, se aprietan y se mezclan con la pulpa. 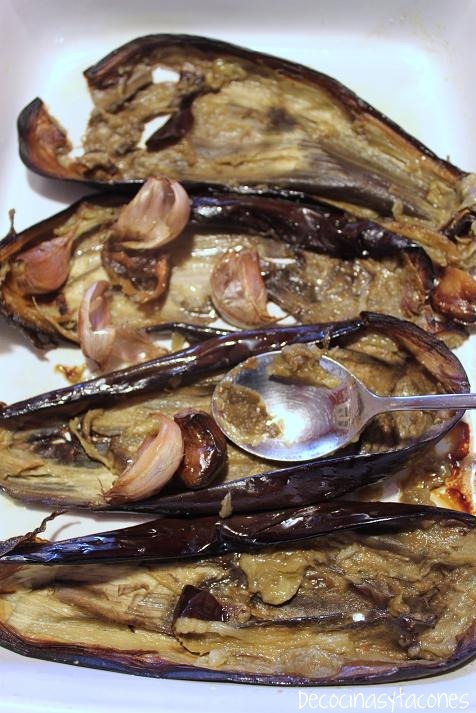 When the oven has finished, we take them out and we remove the pulp of the eggplants with a spoon. Reserve it in a bowl. 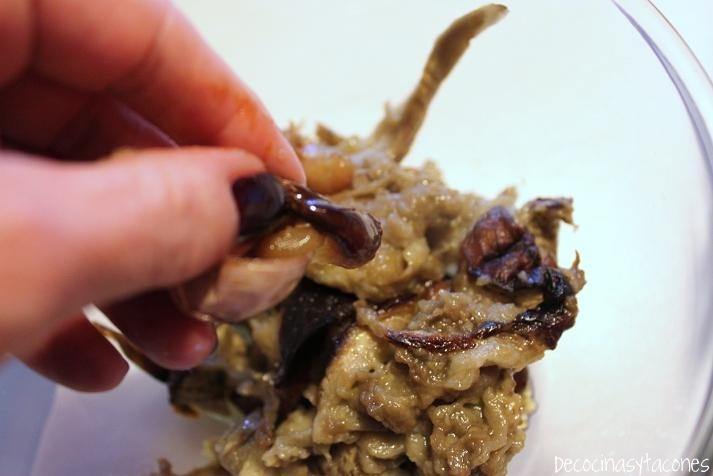 Squeeze the garlics into the pulp. Esto es lo que queda. Se pican con cuchillo y tenedor, lo más finas posible. 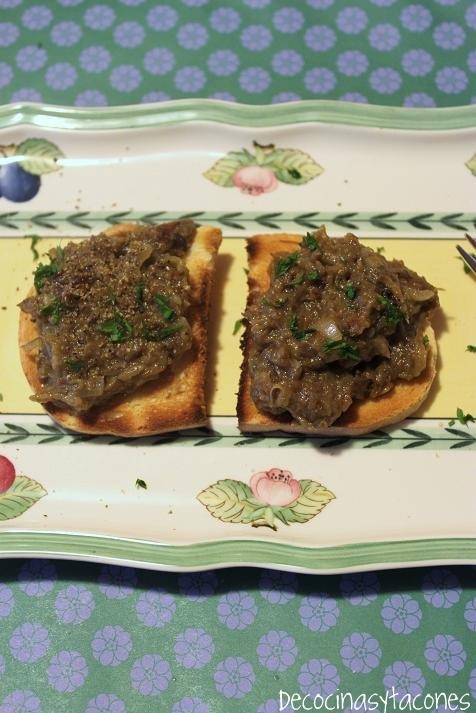 To chop the eggplant, use a knife and a fork, it has to be finely chopped. 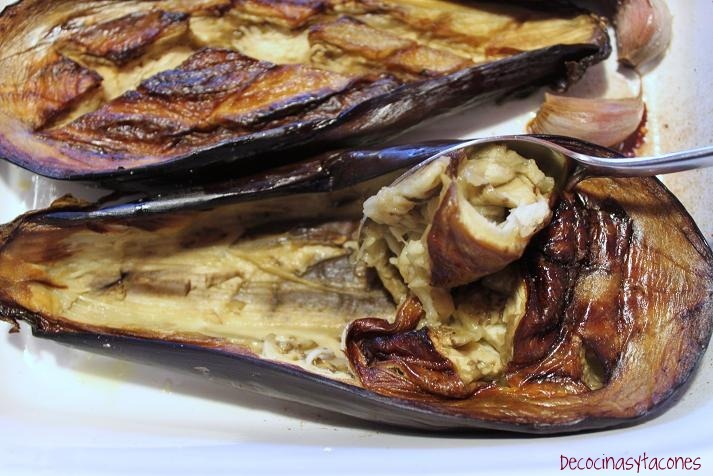 En una cazuela, pochar la cebolleta picada, y cuando tiene color, añadir la berenjena y los ajos. Cocinar lentamente (a fuego bajo) durante 20 minutos. 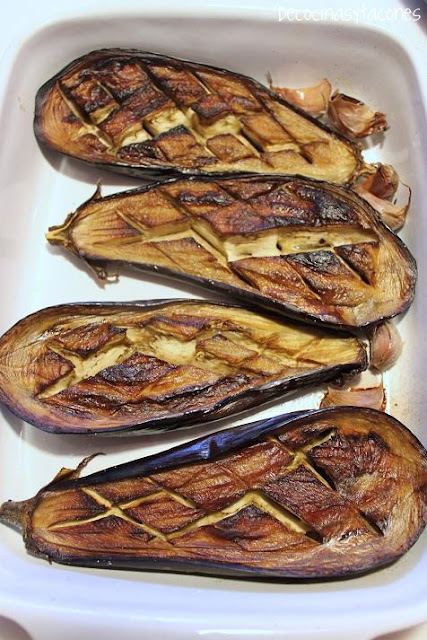 In a saucepan, cook the onion under low heat, add the eggplants . Cook slowly for about 20 minutes. 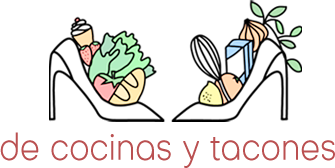 Colocar sobre tostadas de pan. 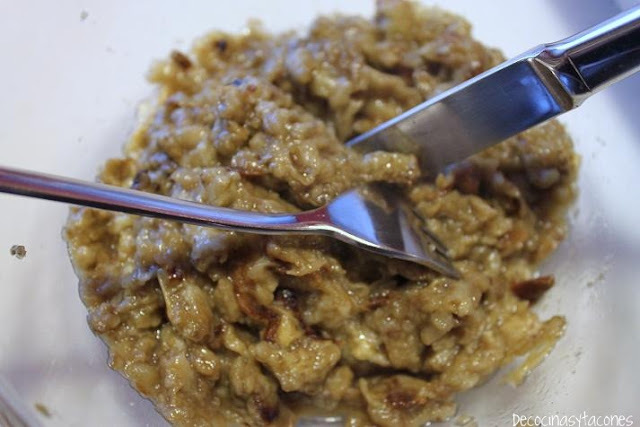 Spread the mixture over slices of toasted bread. Se puede añadir la mezcla a un plato de pasta. You can also add this mixture to some boiled pasta. Se puede tomar fría o caliente. Nosotros la vamos a tomar caliente. You can have it either hot or cold. We´re going to have it hot today. 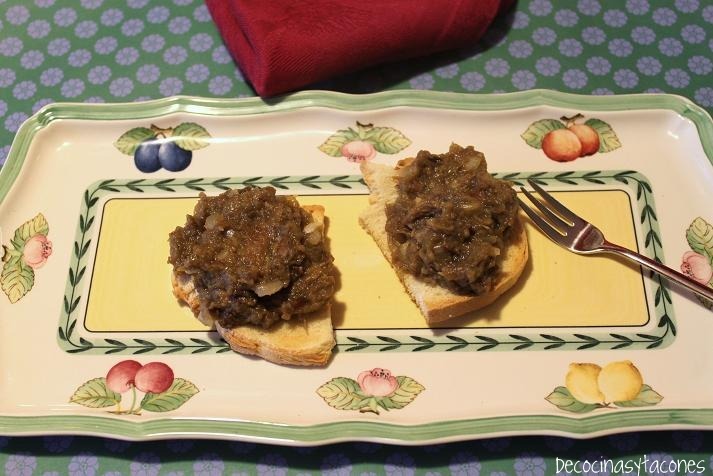 Q gracia, yo no habia oido nunca hablar del caviar de berenjena y el otro dia una amiga me lo puso para cenar! I'm not very good at cooking eggplant so I should take a lesson from you -this looks perfect!